Jensen mic input transformers are legendary for their sonic transparency. All use internal Faraday shielding to virtually eliminate hum, buzz, and RF interference and are enclosed in MuMETAL® magnetic shielding cans to reduce hum caused by nearby magnetic fields. A range of step-up turns ratios is offered to optimize noise performance for various input stage designs as are designs with additional shielding. All Jensen Transformers offer extended low-frequency and Bessel-tailored high-frequency responses, which results in the ultra-low time-domain distortion (DLP) that only Jensen offers. Insertion loss is minimal and adding phantom power is simple. Turns ratio is generally selected for lowest total noise. Lowest noise will come from matching the “optimum source impedance” of the amplifier to the transformer’s “secondary source impedance” – shown in the table above to the right of the colon under “Impedance Ratio.” The optimum source impedance for any amplifier can be calculated by dividing the amplifier’s voltage noise spectral density in V/ √ Hz , such as 1.2 nV/ √ Hz (1.2 nano-volts per root-Hz) by its current noise spectral density in A/ √ Hz , such as 2 pA/ √ Hz (2 pico-amps per root-Hertz). In this example, using figures for the AD797 low-noise op-amp, the answer is 600 Ω, making our JT-16A with its 600 Ω source impedance the best choice. This matching is not critical and mismatches of ±50% generally make less than 1 dB change in total noise. For vacuum tubes, voltage and current noise numbers are difficult to find. However, when they are available, the calculation will generally indicate an optimum source impedance higher than 15 k Ω. Due to the complex tradeoffs in transformer design, our JT-115K-E is the highest ratio (and secondary source impedance) we can produce and stay within Jensen performance criteria. The JT-115K-E gives outstanding results and we recommend it for all vacuum-tube applications. If the above calculation is performed for Vacuum Tubes, the value obtained will normally be much higher than the secondary impedance of even our JT-115K-E transformer. We do not manufacture Microphone Input Transformers with ratios higher than 1:10 due to the limited bandwidth that is possible in designs of this type. 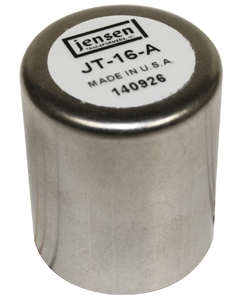 The JT-115K-E will work very well in most Vacuum Tube applications.